Today is the last day of the school term and we are having a gingerbread party. 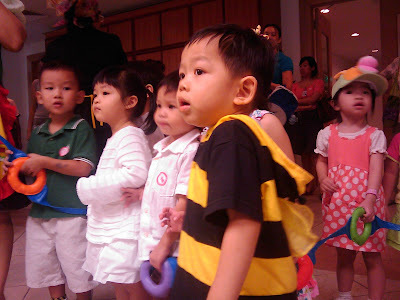 Everyone came dressed in costumes so Ethan came as a bumblebee! We had the gingerbread story and a simple character "parade". Now we are eating gingerbread men, some who have been home-baked while others are wrapped in SwissBake and Jones the Grocer bags. I must admit that this simple theme adds much fun and value to the whole day and the kids love it!